Ever since Tesco brought out a gluten free Katsu curry in their free from ready meal range, I’ve been dying to have a go at making it myself. There’s something about the spicy, Asian-inspired sauce with the crispy chicken that just makes this dish amazing. I just had to master it. Luckily (I hope!?) for Steve, I have spent the entire week perfecting this recipe – we are on our third gluten free Katsu curry in three days! With soy sauce, stock, honey and spices, it’s a delicate balance of sweet and salty to make sure the sauce is just right. Luckily, when it came to the chicken element, I have already had a lot of practice from making my ultimate gluten free fried chicken recipe the other week! When it comes to the sauce, I found the best stock was the Knorr gluten free chicken stock pots. I tried some other variations, but this one definitely came up trumps. A top tip – I found this best when the stock was made with one pot to 750ml of water. The lighter stock meant it wasn’t too salty – when I tried this with a more concentrated version it was a bit too much. I tried this with and without the honey, but I much preferred it with. The hint of sweetness paired really well with the gluten free soy sauce. When it came to the soy sauce, I used the Clearspring organic tamari gluten free soy sauce. Make sure you use a gluten free version as ‘normal’ soy sauce contains wheat flour. Also, check that your curry powder is gluten free too. I prefer mild, but if you like the heat, use a medium or hot curry powder for an extra heat! For the rice, I just went for the lazy option and used a microwave bag of supermarket jasmine rice. It just makes this a really quick and easy option. The chicken can be cooked while the sauce is simmering, which means everything will be ready at the same time and you can just chuck the rice in the microwave two minutes before serving. This gluten free katsu curry has definitely now become my Friday night ‘fake-away’ staple. You could even make it all the night before, then heat up the sauce and chicken when you’re ready to eat. I like to add some fresh coriander and spring onions for extra flavour too. Oh, and did I mention it’s also dairy free too? Even better! 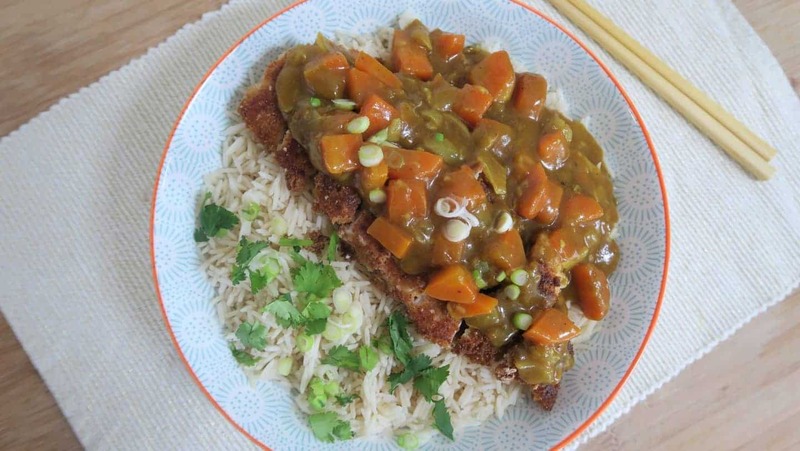 A gluten and dairy free katsu curry recipe, with crispy fried chicken and a delicious Asian-inspired sauce. First make the sauce. Peel and chop the onion, peel and crush the garlic cloves. Peel the carrots and chop them up - I prefer it cut into quarters lengthways then cut into chunks. Heat the rapeseed oil in a large pan and add the onions and garlic. Fry on a low-med heat for 2-3 minutes until they soften. Add the carrots, stir and place a lid on the pan. Cook for around 10 minutes, stirring occasionally. Add the gluten free flour and curry powder and mix well. Cook for 30 seconds on a medium heat. Next, add the stock gradually, stirring so there are no lumps. Add the soy sauce, bay leaf and honey, stir well and bring to the boil. Once boiling, turn down to a simmer and leave to simmer for 20 minutes, stirring regularly. While the sauce is cooking, make the chicken. Blend the slices of bread in a food processor to make crumbs. Place the flour seasoned with salt and pepper, the egg (whisked up a little) and the breadcrumbs on thee separate plates. Place the chicken breasts between clingfilm and bash them with a rolling pin until they are around 1/2 to 3/4 of an inch thick. Coat the chicken breasts in the flour, then the egg, and then the breadcrumbs. Make sure they are coated evenly. Heat the oil in a flat-based pan on a med-high heat. 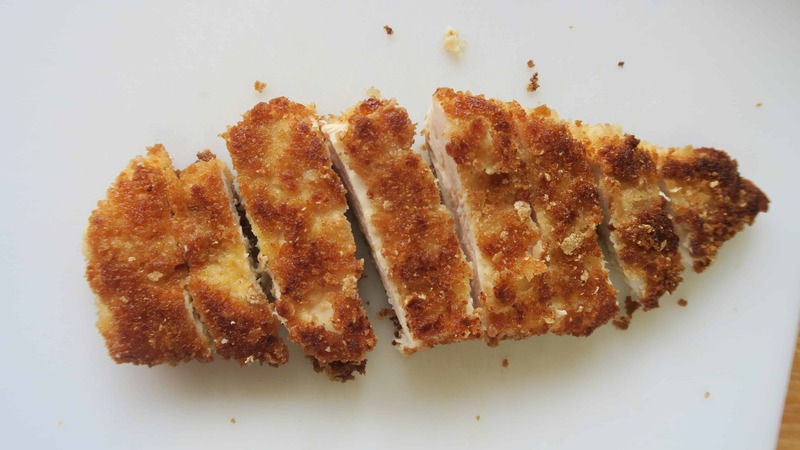 Once hot, add the breaded chicken breasts - you want them to sizzle nicely as they go in! Cook on a med-high heat for 5 minutes on each side; they should be nice and golden on the outside. Microwave the rice, and once everything is cooked, serve up. The sauce should be nice and thick, but pourable. Place the rice on the plate or bowl, slice the chicken up and place on top. Then pour over the curry sauce and sprinkle the spring onion and coriander on top. I like to make the stock as per the instructions for a light stock. Knorr chicken stock pots worked best for me in this recipe. 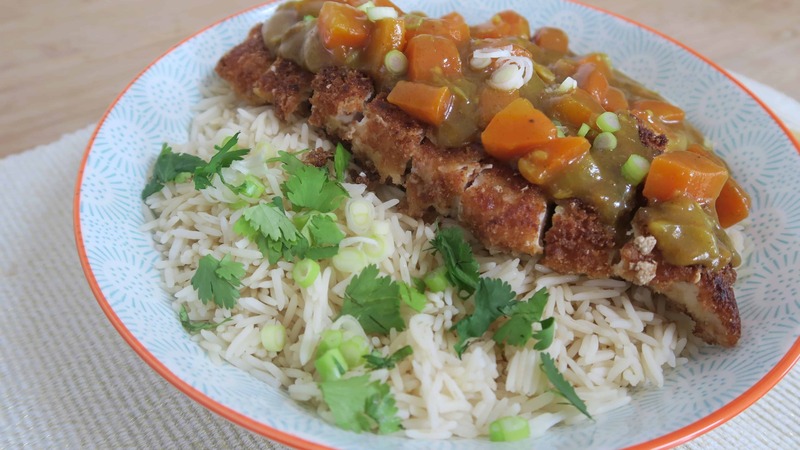 There you have it – my super easy and tasty gluten and dairy free katsu curry recipe! 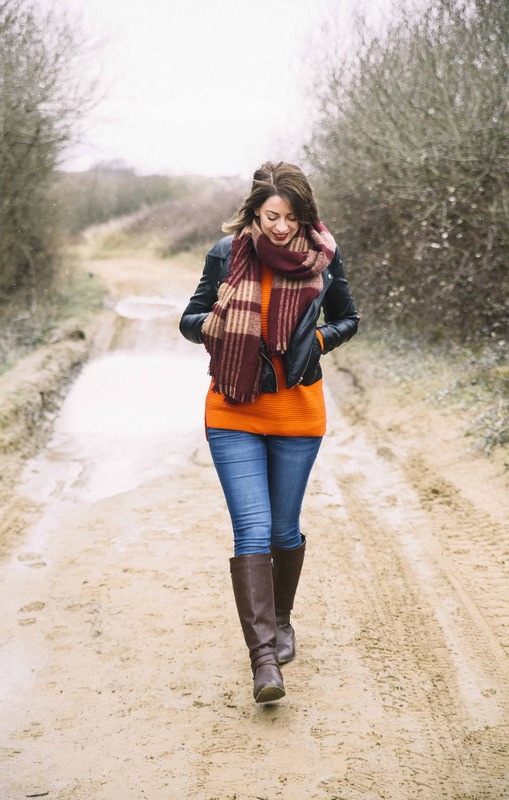 If you give this recipe a go I’d love to see – why not join my new Gluten Free Blogger Facebook Group and post a photo in there? Come on over and say hello, it’s a lovely group with some amazing people sharing their gluten free tips and tricks! You might also like my gluten free fried chicken recipe, or my gluten free Singapore rice recipe – both are really easy and quick to throw together! Let me know if there is anything you’d like a recipe for next, I love receiving your suggestions.